Sedum reflexum is the species from which Sedum reflexum ‘Blue Spruce’ and ‘Angelina’ sprang. Similar in texture and growth habit, the only major difference is the colour – lovely glossy green. Flowers are borne on tall stalks and are yellow, and unfortunately, flop over so they usually have to be cut off. Great in combination planters and tapestry borders, a great foil for other Sedum as well as many xeric plants of all descriptions. 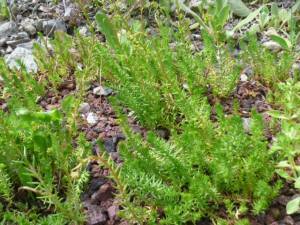 I also use this plant extensively for green roofs along with other similarly hardy Sedum. Sparse yellow flowers in summer attract butterflies and other pollinators, although to me, the foliage is the most attractive feature of this stonecrop.